The Wildwood Inn Hotel is located in Florence, in the state of Kentucky in the United States. This has lodge has several colourful rooms. This lodge has several rooms. The rooms are double rooms with a private bathroom and part of the rooms have a spa area. Each room has a large double bed and a television set. There is a kitchen area with a fridge and coffee and tea making machines. The Aladdin room is a traditional bedouin tent. There is an oriental rug in the center of the room and a private oasis in the bathroom’s spa. The room has a kingsize beds, an individual bed and a bathroom with its own spa. This room is a family room with a kitchen and a television set. The Arctic Cave room is an igloo. 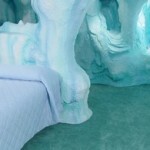 The room’s spa is decorated with glacial decorations and there is a virtual fireplace. The room has a kingsize bed. The Champagne spa room is a duplex room. There is a room with a double queensize bed on the ground floor. A winding staircase leads to the top floor, where the bathroom and the spa, with a spa shaped in the shape of a champagne glass, is located. The Country room has a bed inside a car. The spa is located inside a shed. There are two rocking chairs where guests can relax and watch TV. The Arizona Cave room is decorated with cave paintings and has a kingsize bed. The spa has a mural depicting a desert and the lounge area has a decorative fireplace. The Cupid room has a large kingsize bed. This room is decorated in white and red. The private spa is red. One of the Double Bed rooms has views towards the pool and the other one has views towards the gardens. Each room can accommodate up to four people. Part of the rooms are adapted for guests on wheelchairs. Each room has a kitchen area. The Happy Days room has fifties’ décor. This room is filled with splashes of colour and in the center guests will find a queensize bed in the shape of a Cadillac. One corner of the suite is a diner and the bathroom has a spa. The Kentucky Cave room is decorated with stalactites and stalagmites. The cave has a kingsize bed and a large spa area. The King Bed rooms have a kingsize bed, and have views towards the gardens and the pool. The television set is located inside a wardrobe. There are several King Spa rooms. Each room has a kingsize bed and a spa with square bathtubs. The Nautical room is decorated in shades of blue, with nautical knots and murals of southern oceans. 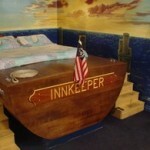 The kingsize bed is a boat and the spa is decorated with waves. The New Mexico Cave room is another cave, with grey walls and high ceilings. The room has a kingsize bed and a cavernous spa. The NY Central Park room’s main feature is a large mural of the city. There is a kingsize bed and an individual bed in this family room. The room has green decorations and a bench on the balcony. The Statue of Liberty Room is another family room with a kingsize bed and an individual bed. The room is decorated in greens and blues. The Oriental room has traditional Asian designs. There is a kingsize bed and a spa with a bathtub for two. The Pirate Ship room has the shape of an ancient ship. This family room has a wooden kingsize bed and an individual bed. Polynesia is a room that will transport you to a tropical island. There is an island where the kingsize bed is located, and another island for the individual bed. There is antique furniture and gold and red decorations in the Royal rooms. The four poster kingsize bed is located next to the Victorian spa and the claw foot bathtub. The Safari Hut rooms are huts located on the hotel’s territory, farther away from the main building. The twelve cabins have views towards the lagoon and are decorated with bamboo. Each hut has a kingsize bed and a spa. Speedway rooms are rooms for guests who enjoy racing. The sofa is a racing car and there is a large television screen. There are more than 50 car replicas and racing posters decorating the room. The Tennessee Cave room is another cave. This cave has a kingsize bed and an individual bed. This family room has a private spa. The Treehouse room has a kingsize bed between the branches. This family room has another individual bed near the tree trunk. The trunk is a winding staircase that leads to the spa, the decoration of which is similar to traditional thermal baths. The Urban Canyon room is another family room, this one decorated with boulders. The bathroom is similar to a thermal bath and has a bathtub for two. The Venetian room has two twin beds in the shape of gondolas. The spa is decorated with murals representing the city’s canals. The Victoria Floral room is filled with antiques. This Victorian room is decorated with flowers and has a kingsize bed and two twin beds. Victorian Tapestry is a suite with an antique kingsize bed and Victorian decorations. This room is a duplex room. The second floor holds two carved twin beds. The Western room represents a traditional Wild West pub. The kingsize bed and the furniture in the living room area is made of wood. There are Aztec murals in the Aztec Jungle room. The kingsize bed is located between Aztec ruins, the bunk bed is located on the other side of the ruins and the jungle area is the spa. The Tropical Dome is a meeting spot located on the hotel’s territory, and the place where the main pool and the children’s pool are located. Next to it is the hotel’s spa, which has several waterfalls. There is a play area close to the spa. The hotel is located close to the airport. Guests can organize events next to the hotel’s main pool in the Tropical Dome. This hotel and resort is located close to the city of Florence in the state of Kentucky. Guests will be able to explore the hotel’s territory and the nearby towns. Marca el enlace permanente. Sigue todos los comentarios de este post con el RSS. Escribe un comentario o deja un trackback: Trackback URL.